Time is an extraordinary thing. There is always the same amount of it floating around, but sometimes it seems that there is not enough, and at other times that there is too much. Sometimes we don't know what to do with it, and sometimes we long for fifty times the amount that we already have. When we are young, time is a very big thing. It means waiting, it means we can't have what we want now, it is what adults have. We don't have time for it. It is not really for us. And then, by the time we are old, time is a precious thing. It has become smaller, faster, and we see how much we need it. And when we are very old, time is something that once was, we inhabit time gone by, and do not bother so much about time now and in the future. Everyone experiences the passing of days and nights, everyone experiences the passing of years, hours and minutes. But we all experience the passing of this time differently. For example, I may sit in my studio painting and thinking nothing of the passage of time, while my son revises for his exams in a chair nearby. I may look up after what I think is no time at all, to see him falling off his chair with his eyes crossed, next to me. Son! I will say, You have to study! What is this falling about that you are doing? And he may say Mother, it is half a day past feeding time. The hours are passing so very slowly, they are dragging along and I am quietly dying of hunger and boredom. How is it that you have not noticed? And I will wonder how this has happened. The same amount of time has passed but we have both experienced it differently. Time does it's own thing around and about me, it has no interest in me at all, but I am constantly grappling with it and how to cope with it. How I am feeling affects how I use it. If I have much to do, and feel chipper, capable and enthused, I start my day well. With a merry little hum, I write lists, and make time into manageable bits, I apportion it, mould it and make it all mine. That, I say as I write, is time well spent. I shall have a day on this project, an hour on that, and a week on another. I have it all sorted and within this time frame that I have so carefully constructed, I will achieve all that is on my list. And in between this time that is going to work so well for me, I will do other small jobs and it will all fit in together because I have the time. I have time under my belt, I know what I am doing. I am in control. 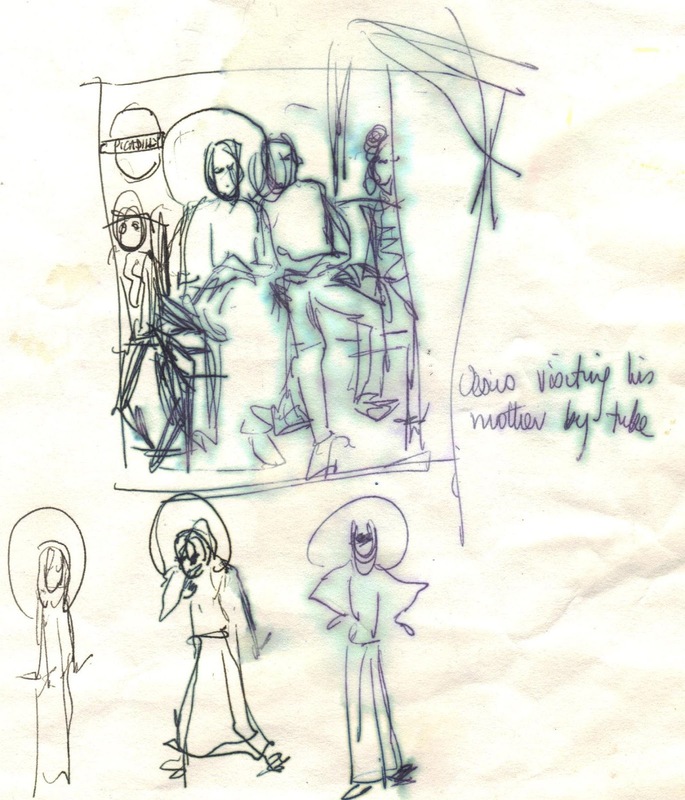 And then, I may feel tired, droopy and not very clear about what to do and how to do it. This makes time into an anxious thing. My plans seem foggy and indecisive, I do not feel like doing what I have planned, and time becomes a fearsome force that is flying past me, out of my grasp and gone for ever. I can't catch it and stem the flow, I can't see how to make it stop and I can't find a way to channel it all to suit me. So then, time becomes a liability. It flies all around me and away and I cannot do anything with it. When I am unsure of what I am doing, and when I am feeling that I ought to be achieving but am simply not doing so, I find myself unable to stop wasting time. I am sitting in my studio, not enjoying not doing anything, hearing the whoosh of time swirling around my head and rushing on, gone for ever, and thinking Lord! If I don't get a grip, if I don't work out what to do and how to do it, I shall fall behind my life and time and the future shall gallop on without me! I should be using this time to do my stuff, but I can't work out what my stuff is and therefore time is passing me by! The answer here, of course, is to stop being so silly and put down my pen, put away my paints, turn off my computer, and go and have a bath. I have found that time, that thing that does not really exist, that thing that we like to take, capture, spend, use, and enjoy, is nothing but a state of mind. I notice it when I am using it to organise myself. I fear it when I am unable to make use of it, and I am temporarily a little guilty when I make up my mind to waste it. If I am concentrating, then I don't notice it. If I am happy, I don't care about it. If I am feeling gloomy, then I am aware of it and I resent it. Mostly, I am concerned with it, not it with me. It is working on me, I am getting older, but I can't take that personally. It is just doing it's thing, and probably has not singled me out for any particular special treatment, it probably wouldn't notice one way or another if I had two projects or six projects, to be done by tomorrow, or else. The last few weeks have been very busy, full of hours placed within a well constructed timetable. I know what I am doing! I said to myself every morning recently, come along time, let's get the show on the road. While working, I said to myself, I can do all of this, see here, my plan, my list, my timetable. I shall stick to it and all will be well. It is all in order and there is a beginning, a middle and an end. But when I finished the projects, suddenly, my time is in free fall again. My time has been filled and have I become accustomed to being busily in control and now, the work has come to an end and I am all of a dither. I know, I say, I shall clean the house, and so I do. But once that is done, and the projects are done, I find I am tired. I have no energy, and I want to sit on my comfy kitchen chair for at least a day and a night, watching the washing machine go round and round. I want to stop talking and stop planning and rest. But - here is what happens - I had a routine, I was used to having my day planned and I can't quite let go of this idea that I should still be doing something. As I sit on the edge of my beloved chair, blankets and cushions at the ready, I hear the whoosh of time passing me by again, rushing at me and rustling the pages of my book as it passes, taking with it the chance to have done something, whatever it was, and leaving me behind. And this is where I have to take a stand. Getting to my feet, I say with authority to whoever is in the kitchen, time is but a concept! Enough of this nonsense, you are, after all, wasting time worrying about wasting time. Put on the washing, count your blessings, and if time is not interested in you, do not be interested in time. Time is a paradox, it is both there and not there. And on that happy note, it is time to enjoy some time off, it is tea time, and what is more, if time is of the essence, it is time to sit down and enjoy it. OK? Good. Sorted. On Keeping One's Pecker Up. This is a very important skill. Some are more able to do it than others. I think it it should be taught in schools, so that those who are inclined to keep their peckers down, or raise them to at best, half mast, will have the ability to go the whole hog and keep the pecker well and truly, up. Keeping your pecker up means to stick your courage to the sticking post. It means, to smile and carry on. Don't let yourself be discouraged. Keep that pecker up and follow through with determination. When all around you are saying words that amount to No point old chap. Give up, it is all hopeless, you will remember your Pecker Lessons in year one at school, and say No. I will not play that game. My pecker is set at top mast, and I shall keep it that way. I shall not give in to gloom and despair. Onwards and upwards, I say, onwards and upwards. How do you keep your motivation going when you feel you would rather not? Feeling that you would rather not carry on is often enough for you to lie down and give in. It is quite hard to overcome feelings. But underneath those feelings is knowledge. I know I must keep going. I feel I cannot. I would rather lie on the sofa and stop, I feel it is time to eat a deep fried mars bar in a darkened room and not answer the phone, but I know, that I must not. Here are five ways in which I attempt to keep my pecker right on top, and I don't think these five ways are very dissimilar to yours. I have a plan. An overall plan, which on paper looks very exciting and do-able. It is easy to write down what I want to do, and what I hope to achieve, because that is not the same as doing it. It feels wonderful to write with a flourish Put on A Graceful Death in Buckingham Palace. Phone Queen and feel, well. I have written it down, therefore it will happen. But though I can enjoy the feelings, I must remember that writing it down is one thing, doing it is another. This is where keeping one's pecker up is very important. I need a spot of optimistic thinking in order to sort the plans into Can Do, and Up The Creek. Keep turning up. This can be very hard. I often feel very like doing what I am due to do, the day before I do it. Come the day itself, and I think - Good Lord, I have not had a day in bed eating cheese toasties and doing Facebook for ages! How about doing it now? And I have to get very stern with myself, and say that I can do that, of course, later. In the meantime, get your shoes on, clean your teeth, and turn up to wherever you have to be, and take it from there. This happens most when I have a deadline and there is work to be done in the studio. There is no way of completing the task other than actually doing it. So I want to go shopping instead, I want to have a long hot bath that lasts half a day, I want to watch an omnibus edition of One Born Every Minute on the laptop, but I know now, through painful experience of not turning up, that I must present myself not only at the door of the studio, but inside it and at my work stations. Once there, and once having started, I can carry on. And, of course, I can then stop. I can't stop something I have not even started, so not turning up means I can't stop to have a break. Not turning up means that I am in a limbo and have only myself to blame as the Queen calls someone else and offers them two weeks in Buckingham Palace instead. Meditate. I do this twice a day. I find the discipline of meditating very helpful. It grounds me and keeps me focused. That is not to say I go into orbit twice a day, nor do I connect with the transcendental overlord very much, if at all, if ever. I feel I must be a very down to earth meditator. I have said this before and will say it again, that most of my meditations are a muddle of imaginary conversations with my mother, a list of all the things I need to buy from Sainsburys, and a hysterical jumble of all the nursery rhymes I ever knew. But, for some reason, it does keep me grounded. Talk to friends. My friends know a lot of things. They tell me the truth, they read between the lines, and they know what I am talking about. We work in the same areas, in the end of life and creative fields, and so I find a great deal of understanding from them. They notice when my pecker is drooping. Aha, they say, come for afternoon tea, and tell me all about it. Let us raise your spirits and set you on your way again, let us have no more of this droopy pecker nonsense, let us sort it all out. For which I thank them, pull myself up to my full height, have another cake, and start all over again. Keep my surroundings lovely. Ahhh. My daughter does this too. I like cleanliness and a certain amount of order. I like to see my pretty things, my colourful rugs, blankets and cushions around me. I like to see my various bits and bobs all in their place, all there to make me smile. When I am cold, I wrap myself in one of my lovely spotty blankets, or my green mohair one from Avoca, that shop in which I would like to live, in Dublin. I like to fill jugs, vases and teapots with flowers, and my kitchen is full of spotty teapots and lovely teacups and saucers. It takes a bit of doing, because I have two teenage boys and three lodgers living here, and sometimes all I can do is clear a space on the kitchen table to ligh a smelly candle and put down a pretty bowl of sweets and imagine the whole house is like this. It is often easier not to do something, than to actually do it. And now, as if on cue, a case study of doing instead of not doing, and of maintaining a raised pecker presents itself. I am now going to get off the sofa, get myself ready to face the blizzard outside, and go into Bognor for an important errand. After that, I will go back into the studio and finish the painting that needs to be done. And along the way, in order to maintain that jolly feeling that I so need to motivate myself, I will buy myself, in Bognor, both a bunch of flowers, and a cream bun. And when I am back I will phone a friend and tell them what I have done, and they will say, well done! Now, off to the studio with you, spit spot, and call me when you have done that painting. While watching telly the other day, I had a brain wave. In the programme, a doctor sat on a patient's bed and told them something or other, nicely, and the patient was happy and the doctor went away. I can do that, I said to myself, I can be nice to people and then go away. That looks good. Other instances in this programme showed some rather difficult people being treated very kindly by nursing staff, and being reassured by them before the nursing staff moved on to do something else. Aha! I said again, to myself, and then I had the brain wave. Niceness Therapy! I will invent a new therapy and it will be called Niceness Therapy. Niceness Therapy means sitting with someone for a while, and being just as nice as pie within reason, without being insincere. Sitting with someone, and for between five or ten minutes to an half an hour, simply being pleasant, kind and patient, may make all the difference. And the good thing is, one needs very little training to do this. A little guidance perhaps, a few pointers on the dos and don'ts (Do - listen, ask questions, make eye contact. Don't - hit them, answer your mobile, disagree violently). It is not about being a smart all-knowing professional, it is not about having a head full of theories and an office covered in certificates of achievements. It is about an individual stopping by and having a chat, about being gentle and courteous, about taking an interest. Can you imagine if for example, on a busy hospital ward, or in a very competitive office, or in a waiting room, a fearless Niceness Therapist stopping by, and giving those that needed it, a dose of calm, good-natured, time of the day type chat? In a busy world, jobs have to get done. People have tasks to complete. There are boxes to tick, agendas to stick to, targets to achieve and quite rightly, if you have all these things to do, you do not have time to sit around being nice. A Niceness Therapist would fill in the spaces in between all this achieving and being efficient by courteously and kindly doing the human interaction thing. I respond very well to niceness. I will stop what I am doing and give you all the attention I can, if you are nice to me. I am sure that you do, too. I have seen shop assistants being nice to grumpy customers, and making them much less grumpy, and even if there is no sale, at least there is no lingering air of crossness. The shop assistant doesn't then roll up her sleeves when addressed by the next customer and say sharply, Well? What is it, Sunshine? The kind of niceness I am talking about is probably best defined by what it is not. It is not the following. It does not cover the need to have a good laugh at whoever is at the receiving end of the niceness therapy after they have gone. It is not so professional that it feels remote and manufactured. And here are a few of the things that it is. Genuine, and coming from an honest heart. Simple and appropriate. You would not offer Niceness Therapy to an armed robber, he may not be in a receptive frame of mind. But you would offer it to a disgruntled old lady in a bus queue, who may respond with relief to a spot of niceness. Available, if needed, in small bite sized bursts. You do not have to set the stop watch and be relentlessly nice to someone for an hour if a small dose of niceness would do the job. A mother who's small child is crying at the school gates before school may benefit from a few minutes of Niceness Therapy, to engage her for an hour may lose any benefits after the first few minutes. It then becomes Scarey Nutcase Therapy. Kind. Niceness Therapy is kind. It is able, by being nice too, to be more digestible. There is a welcome sense of propriety and remove in niceness, that makes it adaptable to most situations and people. A Niceness Therapist does not go to huge training centres to learn how to do it. They do not have exams on how it evolved, or the etymology of the the words Niceness Therapy. They do not have to attend dreary lectures on where it is going, or who did it first and who argued with whom about what it is all about, and they do not have to study and produce case studies of niceness benefits, or case studies of niceness casualties. It is something that is passed on by word of mouth. It is passed on by example. It is passed on by experience. And a very noteworthy benefit of Niceness Therapy is that it stays in the air; the recipient of Niceness Therapy tends then to continue to be nice to the people around them, and so it spreads. A Niceness Therapist is always at work. They constantly notice situations where they are needed, and step in for a quick burst of pleasantry. They are very good at being aware of the need for a kind moment or two, for people who are feeling the need of it but are possibly not aware of this need. Since the movement only began half an hour or so ago when I started to write, I would say that it is a fledgling movement. An idealistic and rather delightfully optimistic movement. As yet, in the last half hour since the idea came about, no one has been employed by any multi nationals, hospitals or up and coming businesses, in the role of Niceness Therapist. I suspect that when they do start employing, Niceness Therapists would have to belong to an entirely independent body with an almost supernatural ability to detect company agendas. We belong to no one, they would say, and cannot be bought at any price. The warming and welcome effect of niceness, that alone, is our goal. We are in it for the goodness of the experience. A Niceness Therapist would be a strong person. Sure of themselves and unafraid of making the first move. They would have a wealth of experience and may well have experienced an ounce or two of tragedy and difficulty in life, to give them that empathetic and fearless edge. I wonder if Niceness Therapists would wear uniforms? Probably not. The movement is now forty minutes old and I think we have dismissed that idea, proposed in the 38th minute, by the 39th minute. These Niceness Therapists don't have to be well either. I remember an old man, very ill in hospital, who was nice to everyone that came his way, and created around him such a haze of goodwill on his ward that no one wanted him to go to his Nursing Home when at last a place came up. And they do not have to be sweet and gentle. I benefited from a lady who I think was a brilliant Niceness Therapist, when I was feeling a bit down. She was a real straight talking Northerner. She sat down next to me and when I told her how I felt, she said with a kind smile and a thump on the arm, Eeee, you talk a right load of rubbish, you do, let me make you a cup of tea. And it worked, what I wanted was for someone to not take what I said seriously so that I could stop indulging in Poor Me feelings. Wonderful. Niceness Therapy is a new movement brought about just fifty minutes ago, by me, after watching the telly. Except if they are nasty, insincere, or manipulative. Don't do it on armed robbers. Pick your moments. There is talk of Niceness Therapists being employed in all major banks, institutions, and businesses. Niceness Therapists are always at work, and do not as yet know that they are Niceness Therapists. I am going to be the first official one. As from now. How Jesus Got Onto The Tube. And More. Today, I am going to introduce you to a phase of painting from the 1980s. At this point, I was unmarried, and living in a flat in Chiswick. My children started to come at the end of this decade, but here, I had time to enjoy painting and thinking, despite having a very full time job at an Economic Consultancy. I know. I was there for light entertainment. Here is what was happening to the Artist Extraordinaire then. The magic of religious Italian Renaissance painting has always been an inspiration to me. In the mid 1980s, I began to want to apply some of the imagery from these old masters, to a more modern interpretation of Christian Biblical stories. I had long been interested in combining the Divine with the Mudane. Here is an example of the kind of painting that I wanted to use. It is an Annunciation, which means the moment that God sends the Angel Gabriel to the young unmarried girl called Mary, in a small town of Nazareth, to tell her that she is going to be the mother of God. It is a very popular subject in religious art. The figures here are of the Angel Gabriel on the left, and the Virgin Mary on the right. Their poses are gentle and delicate as the Angel Gabriel leans in towards Mary, who crosses her elegant hands and leans back towards Gabriel. He speaks golden words to her, and she understands them. He is telling her that she is chosen to become the Mother of God, and that she will have a baby and call him Jesus. How precise the folds of his robe are. 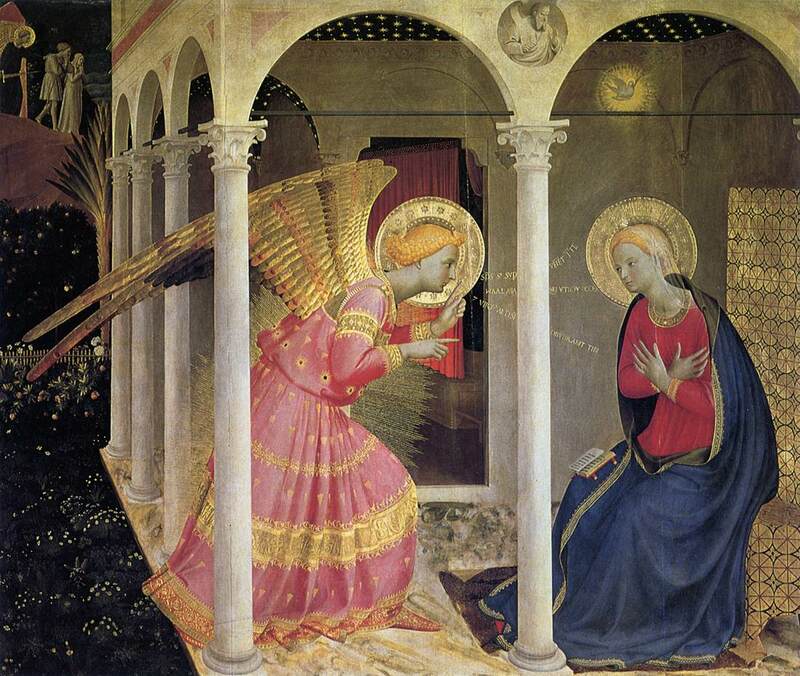 How beautiful the gold patterns that follow each fold and give him form as he stands before Mary. And behind Gabriel, in the dark garden with the jewel like flowers, is a scene of the expulsion of Adam and Eve from the Garden of Eden. We are reminded of the sin of mankind in the background, with the salvation of mankind in the foreground. Above Mary is the Holy Spirit painted in the form of a dove, and in a niche of the gloriously precise architectural structure in which Gabriel and Mary are placed, is a painted small statue of God the Father, his hand held up in a blessing. 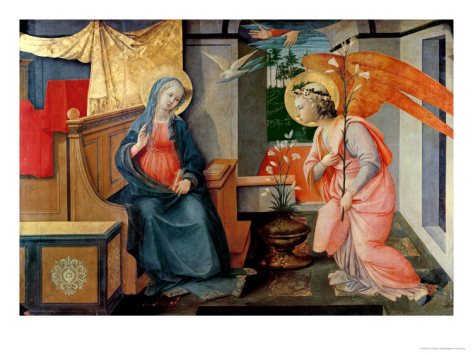 Here is another painting of an Annunciation by Fra Filippo Lippi from around the same time. The symbolism in the painting tells us what we need to know. If we cannot read, the imagery in this painting will make it clear to us what we are seeing. The hands of God send a dove towards Mary, this is the Holy Spirit that will enable Mary to carry the Son of God. Gabriel holds a lily, a symbol of purity, and virginity, for Mary. There are lilies in a pot at Mary's side, and both figures have a golden halo of light around their heads, telling us that they are divine. I love the sense of peace in these paintings. The figures are gracious and posed as if they are not entirely comfortable, and they inhabit a space that is not quite right. The lines of perspective, a new phenomenon for artists at that time in the Italian Renaissance, are nearly perfect but not quite. So we have a feeling of style, beauty, and slight bafflement. The figures are clothed in fabric that falls in wonderful folds around their bodies, but the drawing of the bodies are also not quite right. This adds charm and wonder for me. I love the detail of Mary's cloak, and notice that her orange middle looks too large, as if already pregnant. I love the precision of the furniture and the slightly odd lines of the table on which a book sits, by her left elbow. This kind of art spoke - speaks - volumes to me, and in the early 1980s, I wanted to see what I could do with it. I am going to show you an icon now. 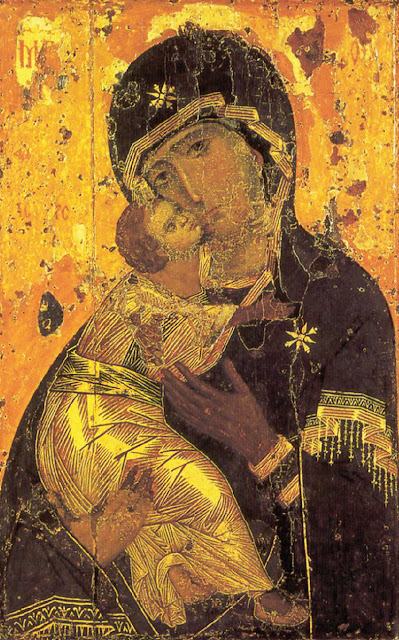 An icon is a serious art form, the very preparation for painting and the painting itself, is considered a prayer. The images are always painted in the same way, and when it is finished, each icon is a venerable, revered, object of devotion. Please look at these images with your heart. I cannot tell you how beautiful I find them. No, they are not real, and yes, sometimes the faces look as if they need surgery, but look at the lines that go into the expressions. They are long and smooth. They suggest gravity, they suggest gentleness, they suggest authority. They are hard to do, try and copy one and see just how difficult it is. We think that because it is not realistic for us, that it must be dashed off in no time at all. Wrong. They take many hours of preparation, many hours of prayer and a dedicated hand and eye to complete. They can take months to finish. There mystery and magic and I am moved by it every time. Look at this. We know this is an intimate moment. Mary and the child Jesus are so close. He gazes up at her, his tiny arms spread out to hug her, and she looks at us with her sad expressive eyes. Her hands hold him with tenderness and ease. Just look at the Christ child's foot. A perfect drawing of a tiny foot. The paint is smooth, the lines elegant, and everything is painted with attention to detail so that we can see the lines in Jesus' hand and on his fingers. We see the bloom in his cheeks, and the frown on his forehead; and look at the graceful line on his neck that should be his collar bone. Placed with confidence, painted with confidence, it doesn't matter that it is in the wrong place. And so. Armed with such inspiration, I began to paint my own versions. I wanted to keep the simplicity, I wanted to keep the gentleness, and I wanted to take as many of the symbols and details of style that I could. And so. I took Jesus, and kept him dressed as if he was in an icon and thought, what can I do with him? What if, I thought one day as I sat on a tube train, Jesus got on the train and went to visit his mother? And I came up with an idea. What if Jesus sat on a crowded train and got squashed by everyone, and no one even noticed? 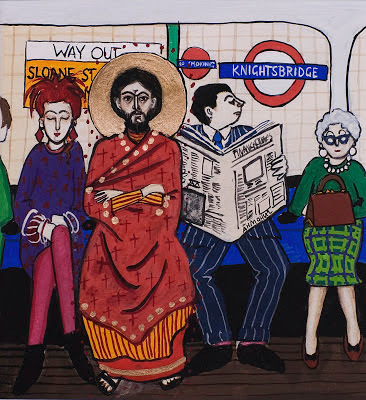 From this idea came Jesus on the Tube, and from this painting, has come endless interest and requests for information as to what it is all about. It is a tiny painting, only 5" x 5". Jesus sits on a crowded train, hands crossed, dressed as if in an icon, looking directly at you. He is wearing a halo, because he is holy, and his face is painted with lines that are similar to an icon. The people next to him do not want to know. One lady on his left has her eyes closed, and the man on his right, is reading the FT as if it would save his life. Beside him, an old lady in glasses stares straight ahead and avoids any chance of eye contact. She clutches her handbag on her lap and keeps her knees resolutely together. 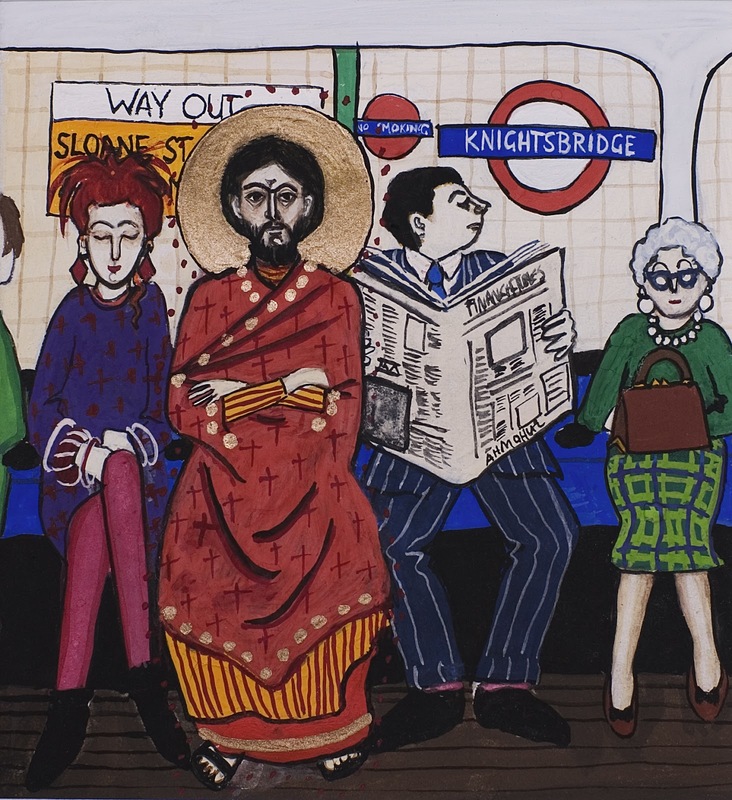 Jesus happens to be at Knightsbridge station because when I was taking notes on a train for this painting, we stopped long enough at Knightsbridge station for me to sketch it and get the details. Jesus is looking at you, and you cannot say you didn't see him. No one else on the train has the slightest intention of looking at him, and we will never know if they suspected that the Son of God was sitting there, on their train, in their carriage, that day. I wonder if Jesus will sit on this train for ever, or at least until someone says, I know who you are! and welcome him back. The great thing is, you can see him. You and he look directly at each other, every time. This painting has been all over the world. It has been used for all sorts of educational purposes, by the BBC, by Alpha International, by RE Today, by various and many churches and it has been part of the National Curriculum for schools. I have given workshops on it, I have repainted the original on commission just occasionally, I have answered hundreds of wonderful questions from school children on all sorts of things to do with the painting (like, what's it all about then? What's he doing? Why's he there?) and I have received many different interpretations on it over the years from all sorts of people in all sorts of countries. 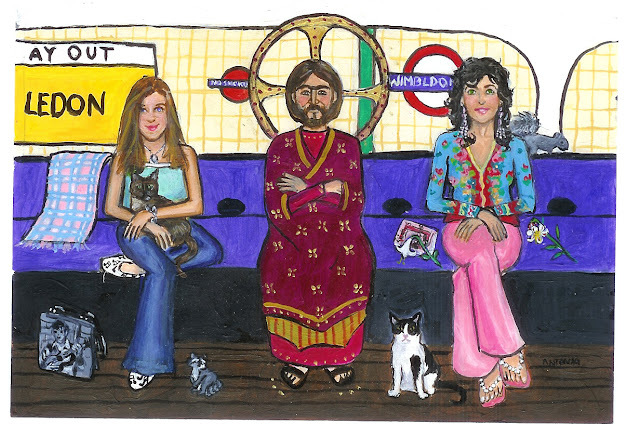 I will never sell this original but I take commissions, and paint portraits of families (or individuals, or friends) next to a Jesus of their choice, at a station of their choice, with each person holding something that represents who they are. For example, one lady held a brochure for a Greek holiday and an orchid, another man had a biking helmet and a kite, people have had a French Horn, or a hamster, or a special bag. Here are two examples of Jesus on the Tubes. See how each person has something with them to say who they are, and often they are dressed in their most favourite clothes. So. Jesus on the Tube gave way to other images that were very much placed in this world. The Madonna Diptych showed how difficult it is to keep one's dignity with a new baby. 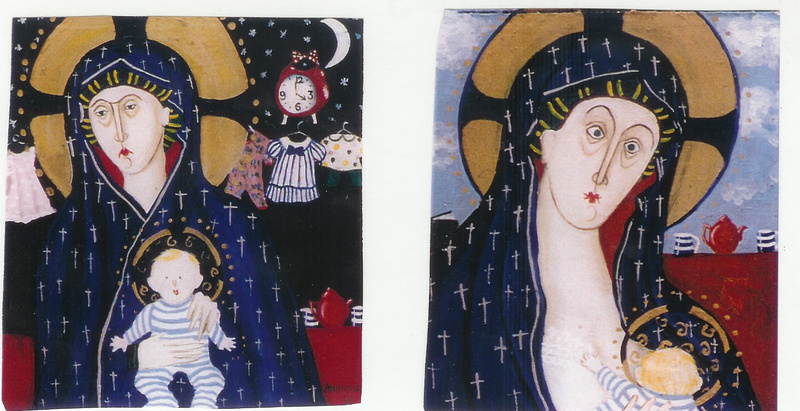 In the first image, called the 4am Madonna, Mary is shown holding a new baby who is absolutely ready to play. It is 4am. Mary has bags under her eyes, this is all so new to her, and a pot of tea is sitting behind her, suggesting that she has been awake a good long while now, and baby is still not tired. Some baby clothes are hanging in the background, and I can confess here that this baby is a portrait of my own new born daughter, and that the Madonna was very much me. I have painted my daughter's clothes in the background, and the down turn to the Madonna's mouth is very close to my heart. The second image is the Breast Feeding Madonna. What we are not told before we learn to breast feed a newborn baby, is how much it can hurt. In this painting, the delighted infant latches on with enthusiasm and poor Mary has to almost cross her eyes. Behind her, the pot of tea. And Mary is wearing the newest of new maternity bras. Just like mine. Another whole new learning curve. These two images were painted on very small blocks of wood, in oils. The 4am Madonna has been reproduced in many publications, and is the front cover to a wonderful book on being a new mother called "4am Madonnas. Meditations and Reflections for Mothers and Mothers-to-be" by Rachel Barton. This diptych was bought by a very interesting couple from America. This next painting is called Easy God. This is painted with all the majesty of an icon of God the Father. It is a powerful image of a thunderous Almighty, full of power, and full of compassion. But he is wearing orange, the colour that identifies Easy Jet. At the time of painting this, I was listening to the owner of Easy Jet discuss other ideas to which the prefix Easy could be attached. I thought, wouldn't it be handy to have an Easy God, who we can pull out quickly in times of stress, with none of the fuss of following a faith, going to church, dealing with all the paper work. If I painted an Easy God and dressed him in the readily identifiable orange, then we have a very good new easy access God. Fabulous. So this was painted, and it is a large painting. About 3' by 2'. None of your small precious icons here, a large, can't be missed, easy access, easy to recognise, Easy God. This was bought by a very thoughtful husband for his wife, as a present. A good man, I say. I know the wife, and she is a very witty and spiritual lady. Easy God. A kind of pop up version for emergencies. This is slightly unfinished, there was writing on the book in the end, but I don't remember what it was. I couldn't resist this next one. C. Pantocrator. A man goes into a church to gaze at an icon on the wall only to find the icon gazing back at him. He is stunned. I love it. A small painting on wood, bought by a very devout man up North. C Pantocrator is short for Christ Pantocrator, Christ Ruler of All, and I liked how C Pantocrator looked like an ordinary name, which the poor man looking on may have thought was the artist's name. In fact it is the title of the painting. I have given Christ all the stylised lines evident in an icon, and the rosy cheeks, and I have used some of the decorative patterns on his tunic and behind him. What is different here is Christ's expression. And finally I will end with an image of the Madonna Waving with a Cup of Tea. This is a tiny painting, about 2" x 2". It is so small that it takes a while to notice that Mary is waving, and Jesus is holding a cup of tea. This was sold to man in London who came back to check, because he wasn't sure if he had seen a cup of tea or not. I got very carried away with this kind of new icon painting, and produced some fairly unusual paintings. They were always produced with respect and a sense of humour, and always in keeping with the spirit of the icons and the Italian Renaissance paintings that I so love. Madonna Waving With A Cup Of Tea.